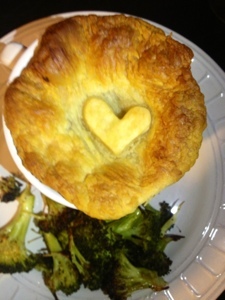 Nothing says comfort food like a warm pot pie on a cold fall evening. It warms the heart and the soul, and I think my VegFam would agree. Normally, I would try to say something witty or funny, maybe even punny, but for this pot pie really all I can say is that it is beautiful. It looks beautiful. It tastes beautiful. Hell I may even paint a portrait of it. That's how beautiful. Preheat the oven to 400 and roast butternut squash until it's tender; about 40 minutes or so. While the squash is roasting get started on the sauce. melt the butter in a large heavy bottom pan. When the butter is melted toss in the onion. Cook until just starting to brown. Add in the flour and let coat and cook for 30 seconds or so. Use the wine to deglaze the pan. Add the rest of the ingredients. Cover and let simmer for about 10 minutes. 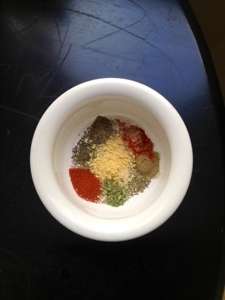 Blend all the spices together and toss the oyster mushrooms until well coated. Saute the mushrooms until they start to brown. In a separate pan saute the carrots and celery. Once tender, combine the squash, shrooms, sauce, celery and carrots into 1 casserole dish or 4 smaller dishes. Reduce oven from 400 to 375. Top with thawed puff pastry and bake for 20-25 minutes in the oven. Where do you get vegan puff pastry? Just thought I would telly you that I am almost happy it is cold outside because this is my favorite winter dish! Just on a side note, I can't find the vegan puff pastry either but I am able to get a vegan whole wheat pie crust that works great too. Thanks for the recipe - we just love it! Becky, you've made my day! Thanks so much for the feedback on the pie crust. I'm so glad you're enjoying the recipe. I am almost happy that it is cold outside because this is my favorite cold weather meal! 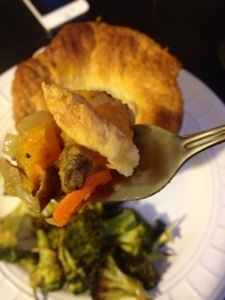 Just fyi, I couldn't find the vegan puff pastry either but I use a vegan whole wheat pie crust.